How do you discover the function of a new protein? Structural genomics researchers are faced with this problem every day, and they have developed a toolbox full of methods to help solve it. The recent discovery the new enzyme isoxanthopterin deaminase shows some of the tools that are currently available for this search. The process of discovery began with genomics, by sifting through the sequences of ocean microorganisms for interesting subjects. Researchers at NYSGXRC have been interested in the superfamily of amidohydrolase enzymes, which includes several well known enzymes like urease and adenosine deaminase, as well as thousands of related enzymes that perform similar, and occasionally not so similar, reactions. They searched through the database of DNA sequences from the Global Ocean Sampling Project, which picks up organisms at random from the ocean, and determines the sequence of their genomes. A few genes were identified as likely members of the superfamily, and then the function search began. The first step was to make the protein. Based on the sequence of the gene, a copy of the DNA was purchased, cloned into bacteria, and used to produce the protein. Then, the structure of the protein was determined (PDB entry 2paj), revealing a typical amidohydrolase enzyme, much as expected. 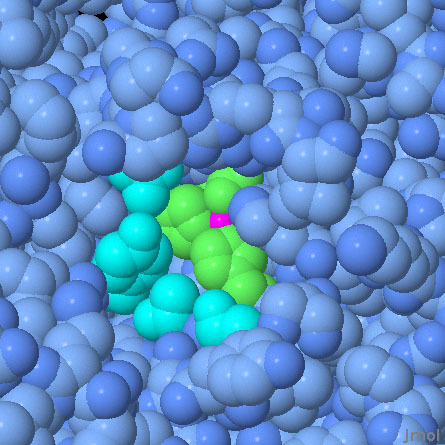 As with other members of the superfamily, it has an active site with a metal ion, situated in a pocket that is the perfect size to recognize a ligand-sized molecule. By comparing the sequence and structure to other members of the superfamily, it was seen that the new enzyme was most similar to enzymes that act on nucleotide bases, such as the enzyme 8-oxoguanine deaminase. So, the new enzyme was tested with a panel of nucleotide-like molecules, searching for one that was modified by the enzyme. Two molecules showed some reaction: the enzyme effectively removed amino groups from isoxanthopterin and the similar molecule pterin 6-carboxylate. 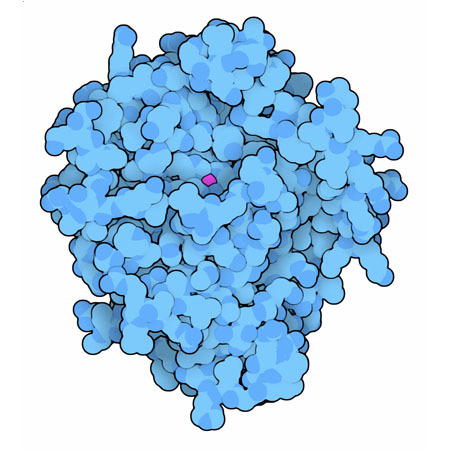 With that observation, the enzyme finally had a name: isoxanthopterin deaminase. Pterins are widely used by cells as cofactors for unusual reactions, and also they play a colorful role in pigments in butterfly wings. Cells contain a variety of enzymes that build different types of pterins when they are needed, and then break them down when they are finished with them. Isoxanthopterin deaminase probably plays a part in this latter role, disassembling unwanted pterins. The active site of isoxanthopterin deaminase includes a zinc ion (magenta) coordinated by three histidines and an aspartate (green). Based on comparisons to similar enzymes, several amino acids (shown in turquoise) are predicted to be important for recognition of the substrate. A water molecule is used in the deamination reaction--use the buttons below to turn it on and off. Hall, R. S. et al. Discovery and structure determination of the orphan enzyme isoxanthopterin deaminase. Biochemistry 49, 4374-4382 (2010).